Representing the UK as reigning 2007 Champions in the Honda Formula 4-Stroke Powerboat Series Team Lings have already shown off their racing talent in the first test of the Formula Honda Powerboat Series in New Zealand. David Cowley, Paul Barkshire and Chris Jary are about to embark on the biggest race of their illustrious racing career. The Lings racing team have been entered into this prestigious event to represent the UK as reigning 2007 champions in the Honda Formula 4-Stroke Series in New Zealand. Having been in the country for only a few hours the Lings Honda team have already been drafting up a race strategy to implement and test during this week. The Lings team are now planning to work on the boat over the next 2 days having been given access to a fully equipped workshop courtesy of Honda New Zealand. Martin Wylie, General Manager of Honda Marine (NZ) has been discussing with the team their race strategy and optimum setup for these unfamiliar waters and is now eagerly awaiting the first testing session. 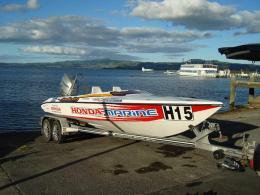 The team will be racing on Saturday alongside some of New Zealand's greatest offshore powerboat racers. With several classes of boats racing together, the scene will be set for some exciting thrills and inevitable spills as the boats fly past at up to 120mph plus. The Lings Honda racing team have also been informed that a dedicated television crew will be flying out to film their exploits over the race weekend. The 2007 season might have been a successful one for the Lings Racing Team but the squad is already hard at work for this year in their new 225hp powerboat named Mis Toft II Lings. "This race in New Zealand, in which we are the only European team competing will help us to develop our team. The Lings Racing Team will evaluate different techniques used in this series which will enable us to work on the best possible set-up for the our new powerboat, which this year will embark on its first season in the premier UK powerboat series the Honda F4SA." said Paul Barkshire. With the first testing session now completed the team are in high spirits and are rearing to go. "The Honda powerboat feels great, considerably different to what we are used to in the UK, but with a few more hours practice I am confident the team will put in a good performance." said David Cowley. "The data we have gained from this session will be pivotal for us to ensure we have the best possible setup in the unknown waters, leaving only the skill of the crew on the day to ensure success. I have been very impressed with the team's professional attitude and their commitment in proving our passion, and determination to provide some spectacular racing this weekend. Before leaving Auckland this morning it was nice to touch base with the national TV station - NZ TV. We also spoke with several representatives of the national media" said Paul Barkshire.